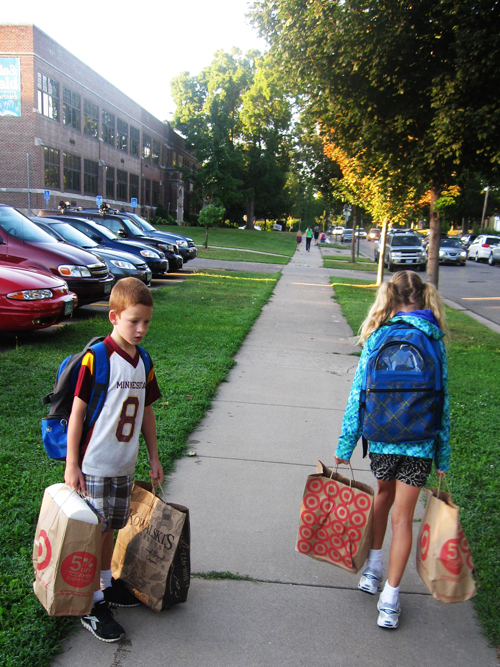 The premature start of school for my 7 and 9 year-olds jolted me out of a rather enjoyable summer daze. It was August 22. That night we diligently went to our school’s open house to meet their teachers. The weekend prior to the visit, I located my daughter Ava’s school supply sheet that was sent home with her at the end of third grade. They must have sent it home early because collecting all of the specific stuff on it can be a summer-long task. I couldn’t find my son, Calvin’s list. The school asks that we drop off the supplies the Wednesday before school starts – at the open house. I argued my point, we don’t have Calvin’s list so it doesn’t make sense to shop in advance. They didn’t like going into their new classrooms empty-handed. Again I reasoned, maybe they don’t actually need all of the stuff on the list or they need different stuff. Plus, what were the four tennis balls on Ava’s list needed for? Later I would find out that they cut an incision in them and they cover the chair legs to cut back on all of the noise as kids fidget and slide around in their chairs. We meet Calvin’s co-teachers first. The two teachers are on two days a week and rotate Fridays. That should keep them enthusiastic, fresh and ready for their 26 first-graders. My daughter’s fourth grade teacher is on her own with, to my shock, 34 students. We confirm pick up and drop off schedules, carefully handwrite our emails about seven times and check out the class roster. Armed with Calvin’s list now, we do not pass go and head immediately to Target. 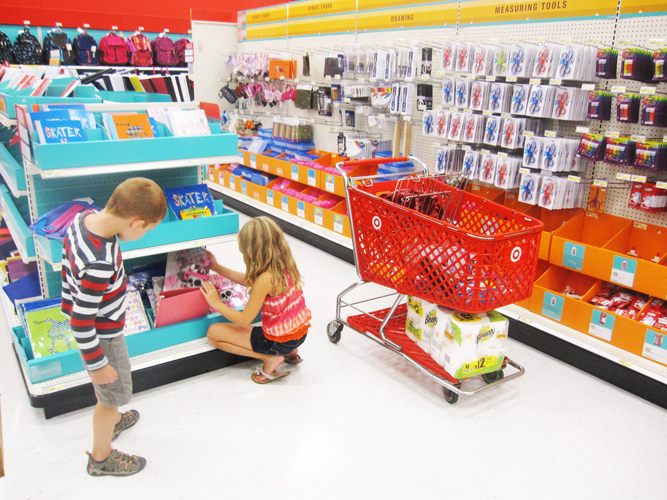 Having lists isn’t necessarily a bad thing, but it does take most of the fun out of shopping for supplies. There are list sub-divisions: child’s own stuff, community stuff, nice to have stuff (needed throughout the year); brand name requests (no Rose Art, Triconderoga No. 2 pencils) and notebook specifics – 100 page, purple cover, 1 subject and wide-ruled. Some supplies overlap between lists. There is little room for individuality (save for the pencil box) and depending on when and where you shop, little chance you’ll find everything in one quick trip. We didn’t go to our usual home-base Target and it threw me off a bit. 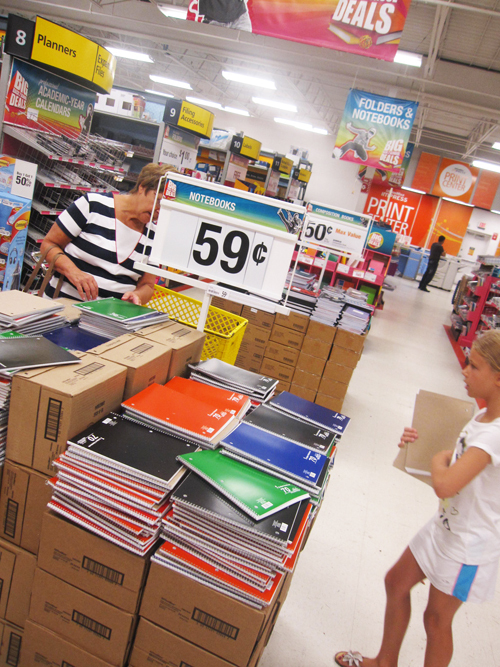 I KNOW there is a school supply section in the back of the store – it’s been there since June. 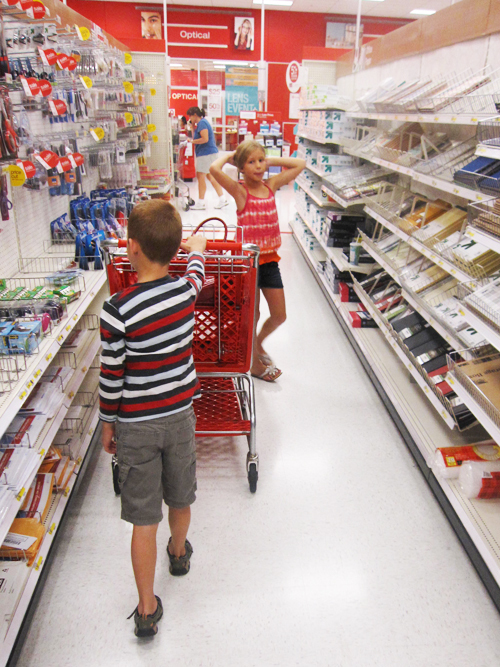 My overly eager kids comb the supply aisles near the check out for quite some time until the lightbulb comes on. We head back to the designated area. It’s a bit picked over and we spend way too much time contemplating matching notebooks and folders and what stuff goes to which kid’s classroom. To add to the challenge, the list items are not sequestered to the supply area. We actually find stuff in every area of the store from band aids to tennis balls. Ninety minutes and $90 later, we head home. We don’t actually have everything yet. I’m ready to give it a rest. When my Mom arrives on Saturday I enlist her for moral support. This trip we are without Calvin and we vote to head to Office Max in uptown because of its close proximity to the day’s earlier outing. I don’t have the highest of hopes. I’m pleasantly surprised that they have the 3mm erasable ink pens in the specific brand required. My daughter tracks down a salesperson who helps us unload nearly an entire bin of notebooks to get to the last of 10 notebooks required – one with a yellow cover. I would call it a 45 minute, $60 trip. At home on Sunday, the supplies that took us 2 hours and 15 minutes to find and $150 to buy, are divided as needed and set in stacks by classroom. We are ready for the first day, Monday, August 27, in plenty of time. We arrive with all the stuff at 7:15a.m. Monday and I bid them good first day. Now I realize we haven’t done one bit of school clothes/shoes shopping yet. Intentional on my part – that’s in the budget for late September. Besides they wear shorts and flip flops August through mid-September anyway and there are better deals on clothing in retail stores. At least we can take some liberties with that and choose their new clothes just in time for September 17 school pictures. I tell myself I’m very savvy… but it’s probably just procrastination. Speaking of which, it’s time to call it a blog post – there’s homework to do. 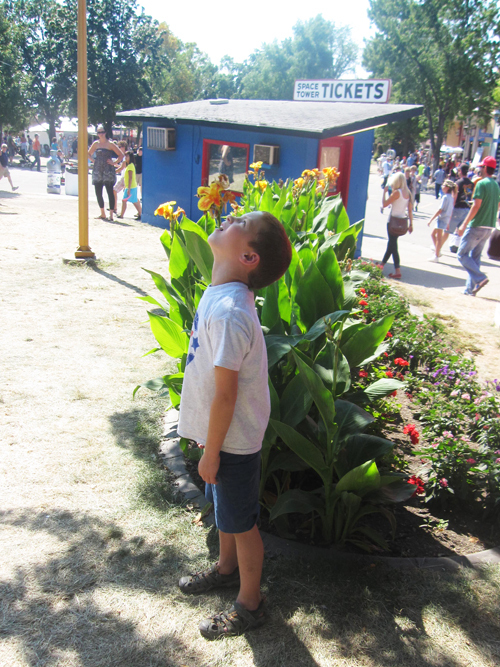 It takes a fair amount of cash to enjoy the Minnesota State Fair. Prior to our annual visit, I always under-estimate and end up with too little cash on hand. This year, with me as the sole possessor of the cash for our crew, I was not going to be doling it out. My 7 and 9 year-olds agreed to the sensible plan I laid out and for the most part, did not complain as we put it in action over the course of our six-hour visit. The plan consisted of this: 1. Anything we get to eat or drink is sharable 2. In most cases, we are just getting one of something and sharing it three ways 3. We are not eating while walking or standing 4. We need to stay hydrated 5. We will all take restroom breaks at the same time 5. We leave when I say we leave. Overkill? Perhaps, but also prevention. The plan took us past our usual four-hour max to six. We arrive on Saturday, September 1, day 10 of 12. Entrance fee: $12 for me, $10 for each kid ($32). Day 10 was much better than last year’s Labor Day Monday visit when none of the workers could muster up any energy to rival mine – OMG, Cheese Curds! was met with glares. This year, upon our 10:00a.m. arrival from a nearby free Park & Ride, the Fresh Cut Fries guys were rocking out to Love is a Battlefield. I give them a fist pump. Love the energy. So fries…. check. First thing on this fair-goers list every year. We opt for the small $5 cup and a $3 lemonade and take up a spot at the MPR booth. With a quick stop at my insistence at French Meadow for three Risotto Poppers at $2 a pop, the kids have their sights on the next door Giant Slide ride. The hot poppers aren’t delish as hoped and the sorry sauce adds to the disappointment. They were so impatient, that I make an exception to the eat and walk rule for myself (because I can) and head over to the slide. I give them $8 for two rides each on the slide. Check. I almost miss spotting them leaving the slide. When I lay eyes on them, they insist they are dying of thirst. That will be $3 please. Unless you want to wait at the KARE11 booth for free water in the line that is insanely long at 11:00a.m. Hydrated we pay $9.50 ($3.50 each one way) for the gondola to take us north to the very far ends of the fairgrounds. It’s a 10 minute ride that feels even longer because my daughter, Ava, is mad that the three of us crammed into one car. We are also delayed at the exit conversing with the three teen workers who are appalled at the next door Sing-Along’s Moves Like Mic Jagger lyrics that 9&10 year-olds were lip syncing. Really? Since we had just sailed over Kidway, they know the rides are just within reach. I buy the $20 pack – knowing that it’s always incorrect for the actual amount we need. They go on some maze adventure ride (5 tickets each) while I engage with my iphone. Then it’s Tilt-A-Whirl time (again 5 tickets each). Loads of fun, if not predictable. We have 8 tickets left that will be burning a hole in their pocket until they can spend them. But it is time for me to choose something I want to do. Ummm, Leinie Lodge. We catch some of Home Free’s act while I enjoy a 12 oz beverage ($4.50) before the kids get way too distracted with the Space Tower. Ava is way pouty and Calvin, my 7-year-old, is terrified that the tower is the ride that drops you 330 feet to the ground. We watch it a few times to be sure, while I down my brew finally seated on a bench. We get the overview of the grounds via the tower ($9 total). It was a good thing until Ava became fixated on the Haunted House and insisted we head there next. Yes, we can go, but it’ll be on the way out I tell her. It’s like 1:30p.m. now and we make our way over to the International Bazaar. Calvin gets creative and orders a slice of cheese pizza ($4?). Ava is so focused on the Haunted House, she can’t eat. She’s whining about it. It is pretty toasty out. We find a spot near the stage and take in the Chinese dancer performances for 15 minutes. Calvin is dying of thirst again, really. That will be $3 please. 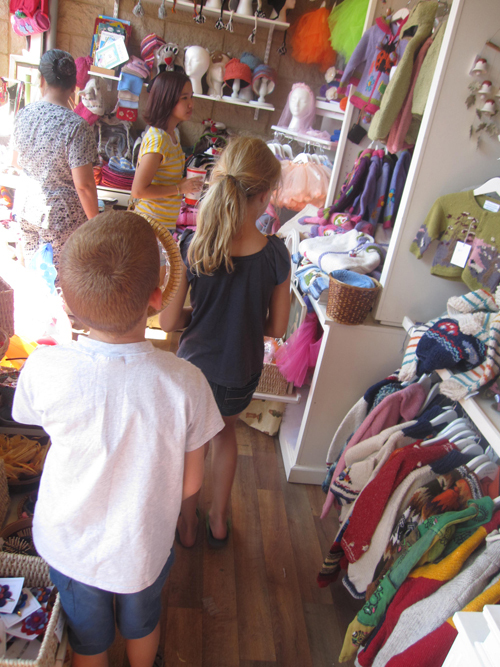 At The International Bazaar, we visit the Rosemary store, knitted clothes and gifts for kids, and a glitzy kiosk that gets our only take-away for the day – two snakes $3 each. Two teenage boys squeeze the small, medium and large snakes and say something about size does matter before they meet my wide-eyes. I’m sure my kids don’t even catch it. Some how, impossibly, we are still hungry. Calvin coaxes me into giving him a piggyback ride. We order up some Cheese curds ($5) and meander around for a table. We find one at the Italian Kitchen and rudely, us non-patrons sit down. From previous experience I know we need to degrease them. Calvin marvels at the grease swimming in the bottom of the dish – They should just call them Grease Curds he observes. Yeah, I agree. So good though…. Again, dying of thirst. $3. Oh no, we can’t go yet. We need a ProntoPup (corn dog). 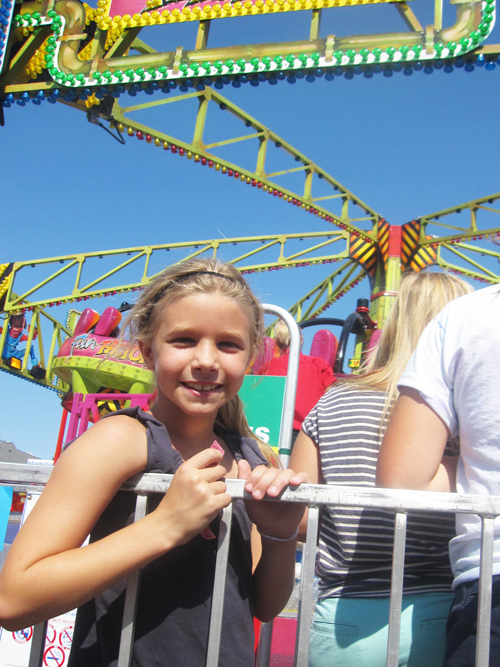 We wait in line on the shaded size of the trailer – the kids delighted beyond a doubt with their snakes. It only takes that one little thing. I get them to agree to give me one bite of each of their corndogs. I think that’s another $9. We end up sitting on the ground in a shaded spot to eat. Our feet in flip-flops are filthy. There’s a few caramel apple leave-behinds next to us. Lovely. It’s about 3:30. 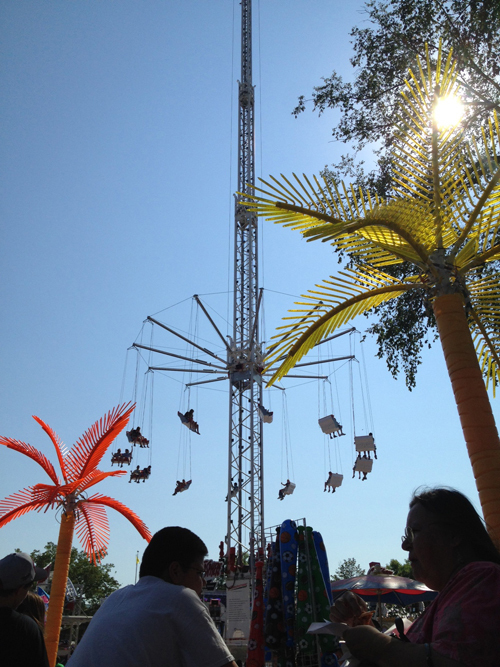 Okay – last rides? We purchase two more tickets to round out our 8 and the kids each go on one more ride – the Maze in Midway for Calvin and the Fun Factory for Ava. Ava’s ride is a bit intense. The other two people in her four-car ride are a mother and daughter. When I check glimpses of them, the Mom is holding the daughter’s chin to one side and the girl is freaking. Ava gets off and breaks down a bit saying she kept hitting her head. She quickly recovers and it’s the most awesome ride ever. We need to be done. Ahh, but there is the frozen yogurt stand. $7 for a large with two swirls, two toppings and Mom gets to share. Half “original” which the workers remind us five times is not vanilla, and half chocolate. Blueberries on the original side and Oreos on the chocolate side. We find a bench. The Stratosphere ride breaks down. Again. I get a picture and tweet it. Not so fun for those people. Let’s hope they have sunscreen. One last thing: The Haunted House. $4 each (I am not in for this one) and I’m a bit concerned, considering all the kids coming out with parents are in tears. One older teen is breaking down sobbing. My kids aren’t out yet. When they do come out Calvin is angry. He’s mad that people grabbed him. The lights totally went out at one point. We hug it out. They are so ready to go. We spent $150, I’m still hungry due to snacking all day and I didn’t go on any substantial rides. All we have are two snakes to show for it. We even passed up Sweet Martha’s Cookies. 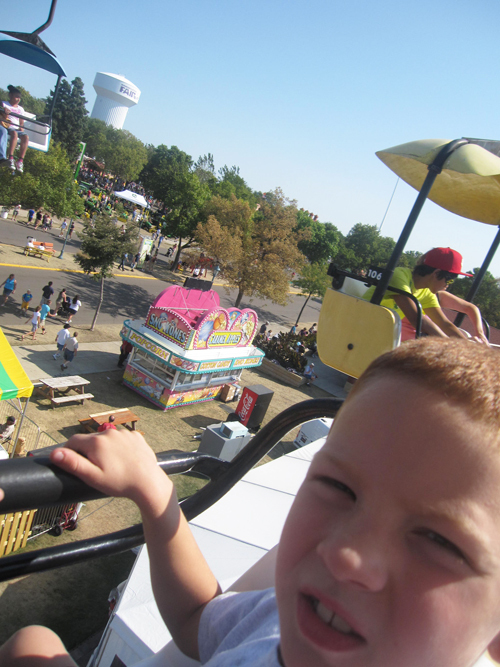 Minnesotan’s attend the State Fair no doubt, but I think it’s a love/hate thing for many. We’ll be going back next year because it is the Great Minnesota Get-Together, but you can be sure I’ll fine tune our strategy – and our budget – a bit more.